Please email Shannon Mishun, or call/text 414-803-5915 if your unit is unable to attend. If you'd like to chair or work on a committee please let us know! Make sure your unit stays in good standing with the Council. If you have any questions regarding dues or donations, please contact Douglas Freiberg. Get the breakdown for 2018 - '19 Council Dues, Donations & Deadlines. In honor of the PTA founders we celebrate our proud history. This site is being created to enhance communication from Council and provide a forum for our local units to exchange information and resources. If you should have any questions or suggestions please contact the webmaster. 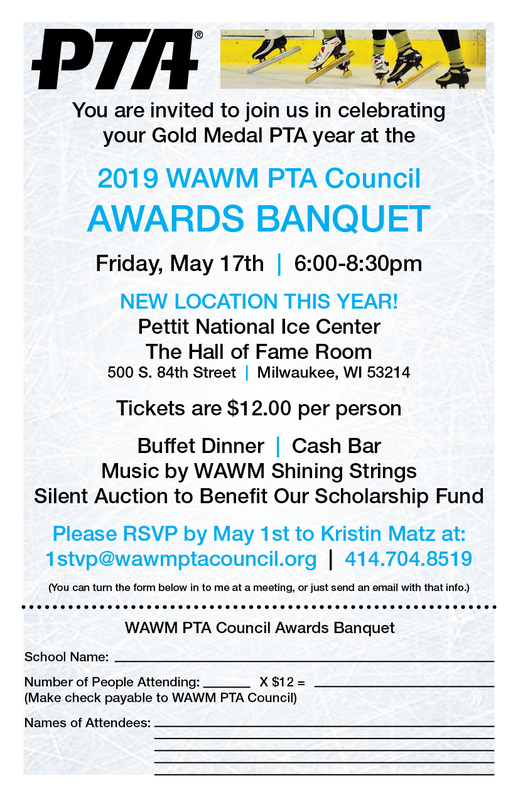 West Allis-West Milwaukee PTA Council has not participated in the development of those other sites, and does not exert any editorial or other control over those sites. Support the 2019 Scholarship Fund! Wisconsin PTA state convention April 12-14th Embassy Suites Brookfield register here! Have an event you want posted? Contact us! Take a minute to fill out our Interest Survey today!